Eugene L. Hintz age 95 of Dodgeville and formerly of Spring Green passed away on Sunday, September 2, 2018 at the Upland Hills Health in Dodgeville while surrounded by his loving wife and family. Gene was born on January 12, 1923 in Milwaukee the son of Leo and Julia (Mileski) Hintz. Gene met Cyrene Riopelle in Milwaukee where they dated, loved to dance, where they married on September 15, 1945 and continued to dance all their lives. Gene is survived by his wife of 72 years, Cyrene Hintz of Dodgeville, 4 children, Keith Hintz of Madison, Julie (Jack) Stephens of Spring Green, Yvonne (Rick) Clark of Sycamore, IL, Camille (Todd) Johnson of Lakeville, MN, 5 grandchildren, 3 step grandchildren, 5 great grandchildren, 3 step great grandchildren, other relatives and friends. A Mass of Christian Burial will be held on Wednesday, September 5, 2018 at 11:00 A.M. at St. John’s Catholic Church in Spring Green. Fr. John Silva will officiate with burial in the Holy Cross Catholic Cemetery in Milwaukee on Friday, September 7, 2018 at 11:00 A.M.. Visitation will be held on Wednesday at the church from 10:00 A.M. until the time of Mass. Memorials may be made to St. Jude’s Children’s Hospital, Upland Hills Hospital or the NRC. The family wishes to thank Upland Hills Nursing & Rehab Center and Upland Hills Hospital for all the wonderful care given to their dad. Online condolences available at www.staffordfuneralhomes.com. The Richardson-Stafford Funeral Home of Spring Green is assisting the family. 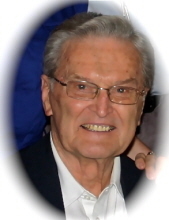 "Email Address" would like to share the life celebration of Eugene L. Hintz. Click on the "link" to go to share a favorite memory or leave a condolence message for the family.